An intelligent agent is an entity that performs its task in a given environment by exploiting the knowledge acquired from its interaction with the environment during problem-solving process. Over the past two decades, multi-agent systems have emerged as a new methodology to address the issue of organizing a large-scale system by assembling and coordinating individual agents to achieve a goal jointly. Remarkable features of multi-agent systems resulting in their immense real-world applications include low implementation cost, adaptability with dynamicity of environment, enhanced flexibility, great robustness, and ease of maintenance. A multi-agent system is primarily characterized by goal-oriented coordination among its agents, both in cooperative and in competitive circumstances. This chapter introduces the basic concepts of cooperative and competitive multi-agent coordination. It begins with formal definitions of agency and elaborately discusses the perceptual and learning capability of an agent based on its architecture. Gradually, the chapter unveils the emergence of multi-agent coordination due to handshaking of distributed artificial intelligence and machine intelligence. The chapter then highlights the significance of planning and learning in multi-agent coordination to solve real-world problems. The chapter next demonstrates the scope of evolutionary optimization algorithms to maximize coordination efficiency in multi-agent robotics by optimal utilization of system resources. 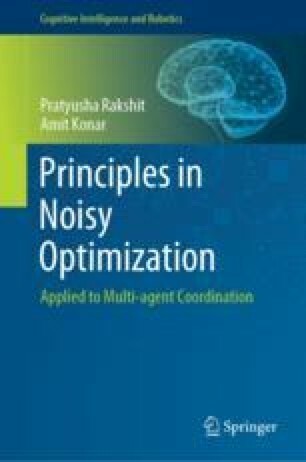 The chapter ends with a discussion on enhancing the performance of traditional evolutionary optimization algorithms to handle measurement noise in real-world multi-robot coordination problems.